Professor Muhammad Yunus, Nobel Peace Prize laureate 2006, arrives this week in Spain to present his new book “A World of Three Zeros”. He will be presenting the book in the three events in three major cities. 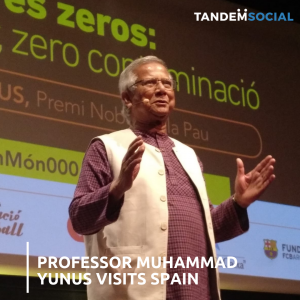 Beginning on Tuesday in Barcelona, Professor Yunus will continue his tour arriving in Valencia on ​​Thursday to host the conference “three zeros, a path to a better habitat”. On Friday 16th he will finish his visit in Madrid, leading an inspiring working day for green and social entrepreneurs. During the events, Prof. Yunus will hold a lecture on his vision for a new economy of zero poverty, zero unemployment and zero pollution. In addition, he will explain how companies and social enterprises can contribute to achieving these three zeros. Tandem Social is a founding member of Social Business City Barcelona (SBC), ​ strategic partner of Professor Muhammad Yunus in Spain. SBC’s main goal is the development and strengthening of social enterprises and social entrepreneurship in the territory.